President Jokowi presenting the Mahaputra award to HS Dhillon. To Dillon’s left are Marshall (Rt) Putu Dunia and Admiral (Rt) Marsetio. 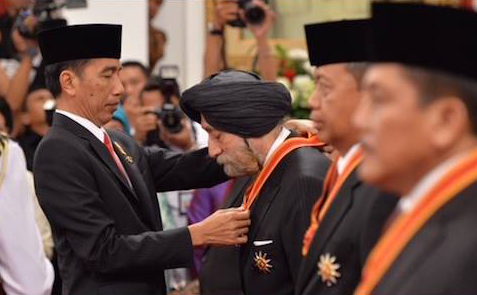 Harbinderjit Singh Dhillon, a prominent Sikh in the forefront of Indonesian political activism for more than two decades, was bestowed the Bintang Mahaputra (Star of Mahaputra), the second highest decoration awarded by the Indonesian government. Indonesian President Joko ‘Jokowi’ Widodo presented the award at the State Palace in Jakarta on Aug 13 to mark Indonesia’s 70th Independence Day. Harbinderjit, 70, popularly known as HS Dhillon, had served in several senior government positions, especially in the area of agriculture and poverty alleviation. In 2011, he was made the Special Envoy to the President of Indonesia for Poverty Alleviation under the administration of President Susilo Bambang Yudhoyono. He was also a member of the National Economic Committee (KEN) from 2010-2012. He headed the Coordinating Agency for National Poverty Alleviation in 2001. Harbinderjit has been at the forefront of political activism for more than two decades. He is a voice for the peasants, a champion of human rights. He has also been a figure of terror, primarily for the corrupt. His words spare no one, according to an article in The Jakarta Post in 2005. “My great grandfather was a farmer in Punjab, India, who migrated to Medan decades back. Plantation runners were much in demand by the Dutch in Indonesia then. But unlike in Malaysia, where the bulk of plantation workers were Indians deported by the British, here they were mostly locals,” he was qouted in the story entitled ‘HS Dhillon, a fearless campaigner’. Also receiving awards in the same ceremony were Air Chief Marshall (Rt) Ida Bagus Putu Dunia, the first Balinese Hindu to be appointed Chief of Staff of the Air Force, and former Navy Chief of Staff Admiral (Rt) Marsetio. The Mahaputra award is akin to India’s Padma Bushan award. It entitles him to be cremated in Kalibata, the National Heroes Cemetery, akin to the US’ Arlington National Ceremetry. Harbinderjit was awarded a PhD in Agricultural Economics by the Cornell University, US, in 1983.